Little Adventures was startead just over 6 years ago when two Mom's discovered the lack of high quality, affordable dress ups available for their children. Jenny Farnsworth (mother of 5) and Heather Granata (mother of 3) decided to start their own little adventure by sewing and selling dress ups at local craft fairs. It didn't take long to realize that sometimes alittle adventure can become a life changing big adventure! During their first year in business Jenny and Heather sewed over 2,000 costumes in Jenny's basement. ﾓThe kids played and we laughed until we were deliriously tired.ﾔ Jenny's husband, Ryan, would come into the sewing room and say, ﾓYou girls are SEW funny!ﾔ which only made them laugh harder. This was the start of wonderful memories and an adventure that will never be forgotten. Little Adventures is dedicated to nurturing imagination and magic that live in young children. Their wonderful collection of princess dress ups, magical mermaids and boy costumes is sure to bring a smile to any child's face. 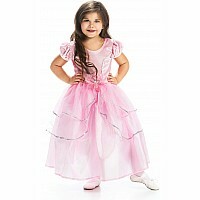 Their affordable dress ups are in stock and ready to ship. You don't want to miss out on the fastest growing market in the toy industry today!